Yodfat (or Yodefat) may be better known to English readers as Jotapata. It was here that Josephus, later known as a significant historian of first century Judaism, commanded the Galilean forces against Rome in A.D. 66. Josephus wrote about the significant battle at Yodfat in his Wars of the Jews (Bk. III:141-339). Yodfat is located about 20 miles inland from Ptolemais (modern Akko) along the main route from Ptolemais to Magdala on the shore of the Sea of Galilee. View of Yodfat from the west. Photo by Ferrell Jenkins. The map below from BibleAtlas shows Nazareth, Sepphoris, [Khirbet] Cana, and Jotapata. 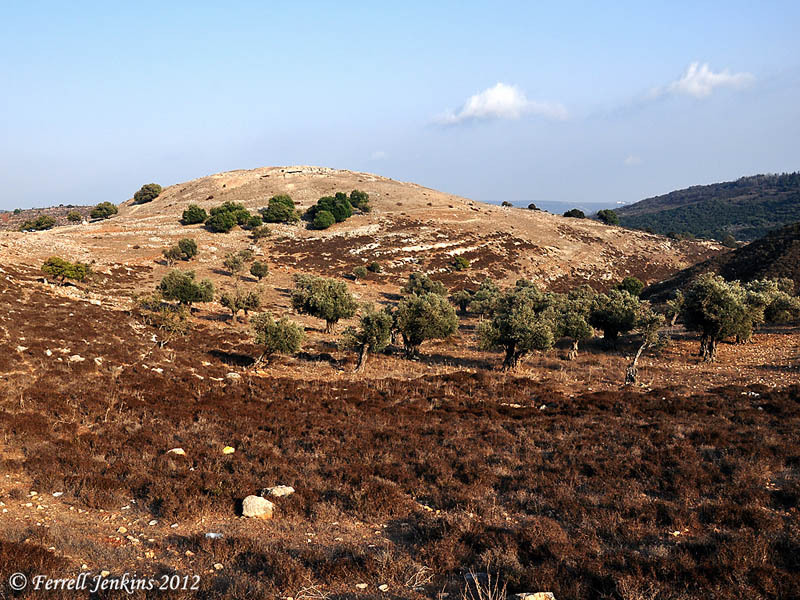 Notice that Jotapata and Cana are situated on the north side of the Beit Netofa Valley. A main road ran from Ptolemais to Magdala through the Beit Netofa Valley. Map showing Nazareth, Sepphoris, Cana, and Jotapata. BibleAtlas.org. Josephus commanded the rebel Jewish forces who were trying to stop the Roman soldiers from reaching Jerusalem. He took refuge at Yodfat. When it was clear that Rome, under the leadership of Vespasian and his son Titus, had the upper hand, some of the troops committed suicide rather than submit to the Romans. Many of the Jewish rebels were slain, but the life of Josephus was spared when he predicted that Vespasian would eventually become Emperor of the Roman Empire. Bonnie Rochman reports that bones discovered in 1997 may be those of men who died in the battle with Rome. Bones from at least 30 people were discovered this past summer in a cistern in the Galilee, giving strong support to Josephus’s account of a bloody battle there between Jews and Romans in 67 A.D. The bones are thought to be the remains of residents of the nearby city of Yodfat, which was besieged by Roman troops en route to Jerusalem to suppress the First Jewish Revolt. The Roman forces captured Yodfat (also written Yodefat and Jotapata and even Iotape) after battling the city’s Jews for 47 days. (Biblical Archaeology Review. 23:06 (Nov/Dec 1997). Josephus records that 40,000 died in the conflict, and and that 1200 were enslaved. Some scholars believe this number is an exaggeration. Whatever the exact number, it was a significant battle in the Jewish War. Yodfat differs from the typical tel (archaeological mound). It is mostly a rock, with few remains on the surface. The site is filled with numerous caves in which the Jewish soldiers hid, and cisterns that provided water for them. The photo below shows the entrance to one of the caves on the south side of the site. One of many caves at Yodfat. Photo by Ferrell Jenkins. Excavations were conducted at the site in 1992 by D. Edwards, M. Aviam, and D. Adan-Bayewitz, revealing remains dating from the Hellenistic period through to medieval times. A fortification wall from the Ptolemaic period was uncovered with three phases of construction evident. To the northwest were the remains of a ramp dating from the time of the Roman siege in 67 C.E. The finds included remains from the battle including ballista balls and iron bow and catapult arrowheads. Rubble walls built at this location seem to have been part of the Jewish preparations prior to the arrival of the Romans. An oil press, pottery kilns, and several ritual baths (mikva’ot) were uncovered. The lower part of the site was reoccupied in the late first or early second centuries C.E., and there were also signs of occupation of medieval date. Some scholars have identified Jotapata with the Jotbah of 2 Kings 21:19. Jotbah was the birthplace of the mother of the Judean King Amon. The town may be mentioned in the annals of Tiglath-pileser III (New Bible Dictionary; Anchor Yale Bible Dictionary). 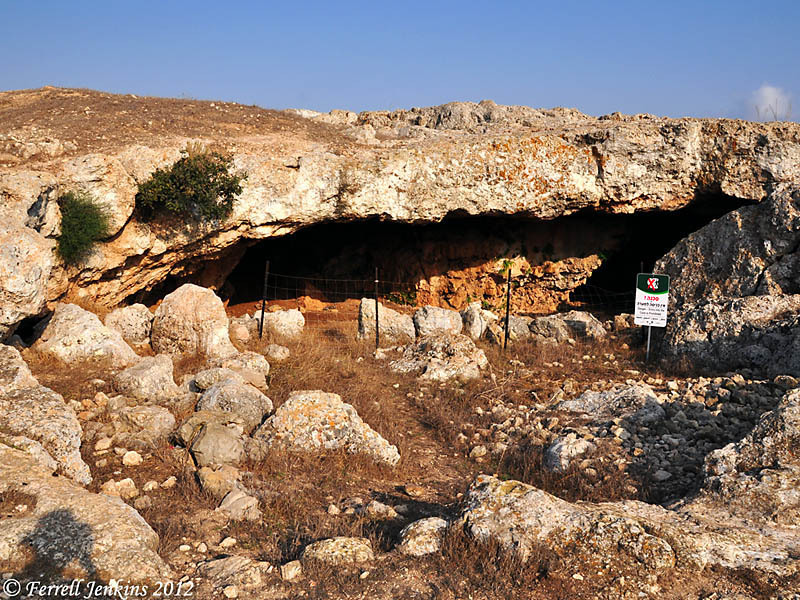 This entry was posted in Archaeology, Bible Places, Israel, New Testament, Photography, Travel. Bookmark the permalink.